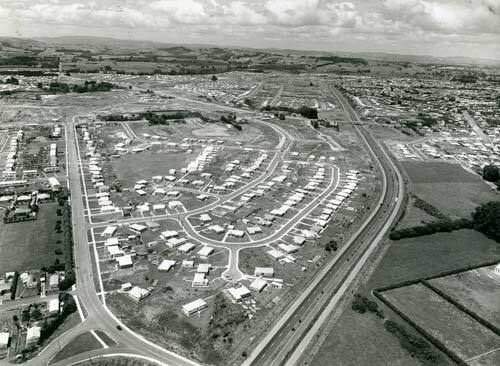 This is an aerial view of the developing South Auckland state-housing suburb of Ōtara about 1964. Ōtara was located near Penrose and Ōtāhuhu, industrial areas which provided an employment base for the working people that were making the suburb their home. This image showcases the low-density, suburban settlement pattern in New Zealand cities after 1945, where single-unit dwellings were sited on spacious sections along curvilinear streets. These, in turn, were connected to main streets that fed into arterial highways such as Auckland's southern motorway (centre right).